Birdsong at sunrise. Walking through the garden, the grass still moist with dew. Coffee and freshly-baked croissants in the breakfast room. Sundowners at the poolside after another lovely day. These are the things you will experience at Riverside Estates, a uniquely beautiful wedding venue holiday accommodation in Hout Bay, Cape Town. An up market guest house venue, with sixteen stylishly decorated rooms, three swimming pools, a Cape Dutch Manor house, an elegant function venue. A tranquil, family-friendly holiday venue on a spreading, 5-acre garden. 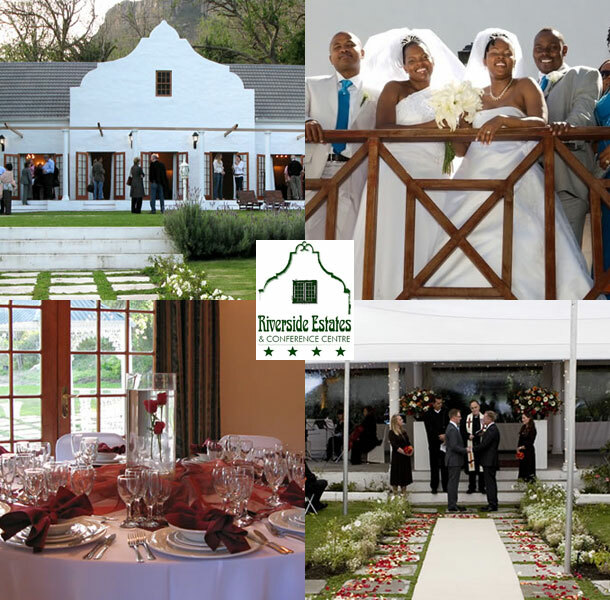 Amidst the natural beauty of the Hout Bay Valley, our wedding facilities include a Cape Dutch function hall which comfortably seats 120 guests, a garden gazebo ideal for wedding ceremonies, and a 6-bedroom manor house where family and guests can sleep on the eve of the wedding. We’re also able to host other celebrations and occasions – birthdays, corporate functions, film shoots and promotional launches. The tranquil stream, a terraced formal garden and a rose flanked gazebo are perfect for any occasion. Our standards of individualised and excellence apply to all our functions. To book your wedding or make an appointment to view this venue telephone the team on +27 (0)21 790-7475. Alternatively for further information or to send an enquiry visit Riverside Estates.